THOU SHALT NOT KILL… EXCEPT: The Unspoken Allure Of Low-Budget, High-Ambition Exploitation – Schlockmania! Viewers accustomed to sleek Hollywood movies often have a hard time with low-budget genre fare because the gap between the filmmaker’s resources and what they want to achieve is too much for them to process. However, what happens in that gap is where the magic lies for the true-blue fan of exploitation cinema. A big part of the romance with this material is learning to see beyond the rough edges of what’s on screen and appreciate the passion and the hard work of the actors and crew. To viewers with this mindset, it seems rather petty to complain about cheap costumes or effects when the filmmakers and cast are knocking themselves dead to entertain you. Thou Shalt Not Kill… Except is exactly the kind of movie adored by viewers with this evolved mindset. Despite being produced on a pocket-change budget, it’s got epic-sized ambition. 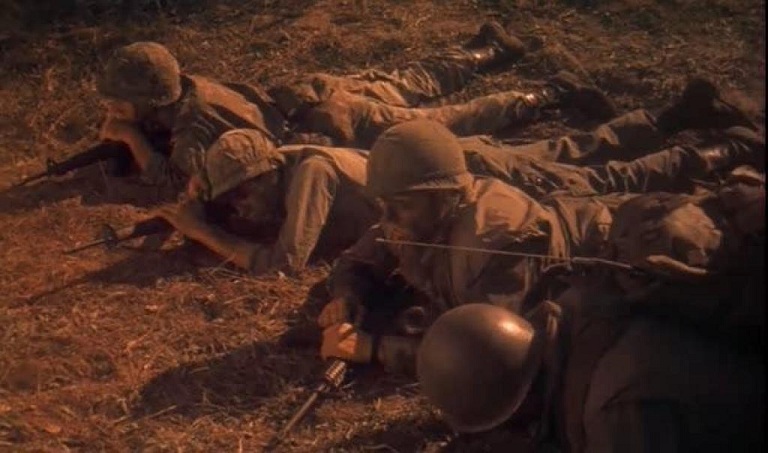 It begins with an elaborate Vietnam War prologue in which we meet Stryker (Brian Schulz), a brave sergeant who earns a crippling leg wound during a brutal battle with the enemy. He is shipped home, where he tries to lead a normal life and resume a romance with old flame (Cheryl Hansen). Unfortunately, a peaceful civilian life is not in the cards for Stryker. 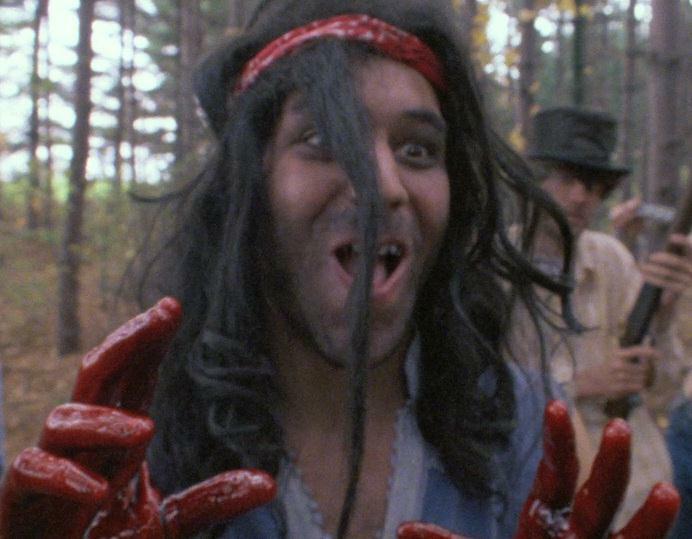 A band of killer hippies is roaming the country side, led by a wild-eyed Manson-esque leader (Sam Raimi!). When they kidnap his girlfriend and threaten a campground full of civilians, Stryker calls on his soldier pals to fight back: cue a third act devoted entirely to action, splatter and humor of the darkest variety. The end result is the kind of full-throttle exploitation fare that modern genre revivalists are trying to make today but can’t quite pull off. The reason Thou Shalt Not Kill… Except succeeds where its would-be descendents fail is that it has ambition beyond mere cheap thrills. When you have a shooting budget of about $60,000, it’s madness to do a film with a period setting and a large number of brutal fights and stunts, including a big Vietnam War firefight. Thankfully for exploitation fans, Thou Shalt Not Kill… Except is the kind of film that looks such challenges in the eye and spits at them. The script has a defiantly epic scope in both spectacle and story size and pursues both aims with dogged relentlessness. 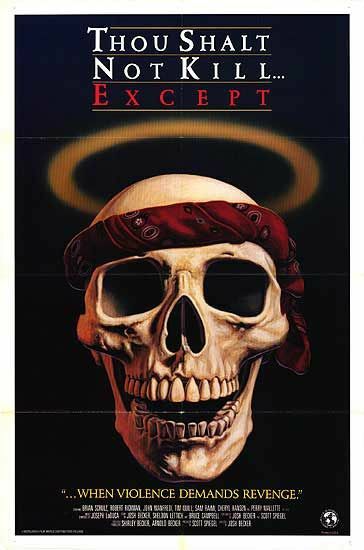 The fact that it’s built around such a unique “soldiers vs. Manson family” premise and packed to the gills with action only enhances its drive-in appeal. However, the truly impressive part is that the filmmakers actually make the script’s crazy ambitions work on the screen. Director/co-writer/co-everything else Josh Becker comes from the same hard-scrabble school of low-budget Michigan filmmaking that spawned Sam Raimi and Scott Spiegel (both collaborate with him here) so he goes for the gusto at every opportunity. Becker opens and closing his film with elaborate action/splatter setpieces and takes on a quirky tone that offsets exploitation movie grimness with slapstick humor derived from the Three Stooges. 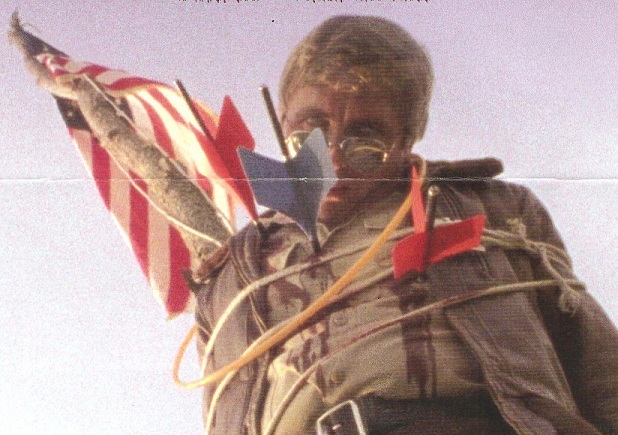 Becker’s resources can’t begin to match his ambitions – for instance, the jungle in the Vietnam War prologue is obviously a wooded area in Michigan and the cult leader wears a wig that flaunts its absurd phoniness right in the viewer’s face. However, such rough edges add charm and character to Thou Shalt Not Kill… Except if viewed through the appropriate exploitation fan perspective. They reflect the handcrafted touch of a movie put together with love by people eaten up with the desire to make movies. Better yet, Becker makes up for those rough edges with a non-stop flow of visual invention and paces the proceedings with some endearingly juvenile locker-room humor. The final touch comes from the cast: like the filmmakers, they make up for any shortcomings with pedal-to-the-medal enthusiasm. Schulz hits upon an unusual blend of vintage tough-guy mannerisms and method-actor earnestness that suits his character and the film well and Hansen makes a likeable, clean-scrubbed love interest. Their work is supported by an array of scene-stealing support performances. 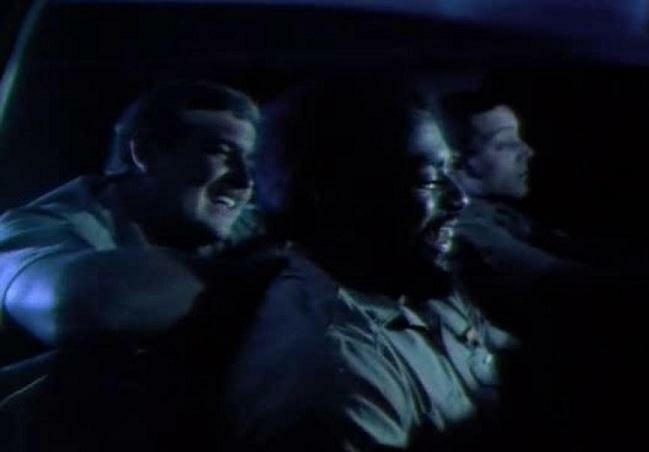 For starters, Stryker’s pals all bring something unique to the table: Robert Rickman is all muscles and machismo as the tough guy, Tim Quill provides Animal House-style humor as joker of the gang and John Manfredi hits both dramatic and humorous notes with skill as the Lieutenant who regrets getting Stryker into the battle that crippled him. That said, the performance that everyone remembers from Thou Shalt Not Kill… Except is the one given by erstwhile director Raimi as the film’s cult leader villain. Mainstream critics razzed it at the time of release but that shows how little they understand the art of b-movie acting. Simply put, Raimi is everything you could ever want from an exploitation movie villain: crazy, funny, creepy and over the top in everything he does. He mixes silent movie facial expressions with an odd, raspy delivery to create a character that is half Moe Howard and half Charles Manson. If you don’t instantly love a performance this wily, you don’t have any business watching exploitation films. In short, Thou Shalt Not Kill… Except surpasses its budgetary limits to deliver the goods on multiple fronts: it’s exciting, original in a deliciously eccentric way and the cast and filmmakers put it across the plate with a uniquely personalized sense of style. That is what exploitation cinema is all about – and its unsung heroes don’t let a little thing like the budget hold them back from crossing the finish line.